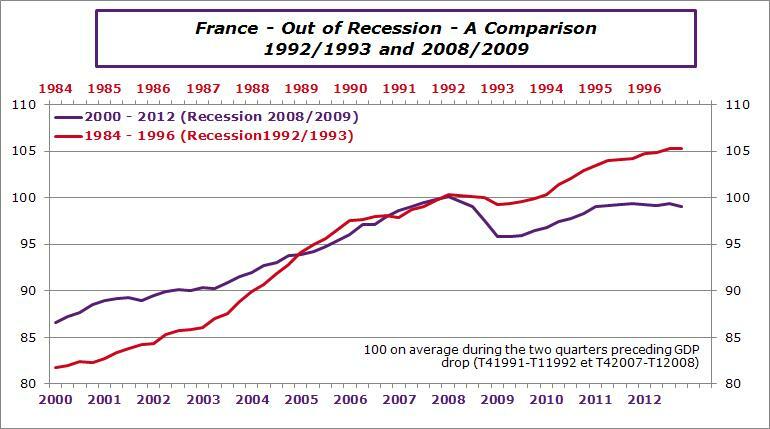 The chart below makes a comparison between current GDP dynamic in France and out of recession dynamic seen during the previous recession at the beginning of the 90’s. This comparison is often done in France. The point is to say that after a poor start at the beginning of the 90’s, French growth became stronger. The point is to say that the French economy will currently do the same. The two profiles are very different. Currently GDP is still below its pre-crisis level. This was not the case in the 90’s where it was more than 5% above. In the 90’s the recession came from twofold: Disequilibrium that led to the European Monetary System (EMS) crisis in the last quarter of 1992 and German Unification. At this time the global environment was supportive and adjustments inside the EMS area were currency devaluations. This type of measure can be put in place very rapidly and change competitiveness in the hour. So Italy and Spain made deep devaluation of their currency, British pound exited and in summer 93 EMS rules were changed with larger fluctuation bands. The government has been renewed in China with the arrival of the new President Xi Jinping, amid doubts about the strength of the Chinese economy. In the United States, Barack Obama has been re-elected at a time when deep fiscal imbalances must be addressed quickly.